After a lot of reflection, I’ve decided to change things up a bit! Quite simply, I want to do more. I want 2012 to be filled with more charity, more selflessness and more random acts of kindness. I want to focus more on DOING and a little less on business. The Daydream Believer Project is so important to me; I know that God has given me the strength and abilities I need to perform awe-inspiring deeds – I look forward to working with YOU to change the world! To kick off this beautiful new year – I’ve decided not to sell the “Birds of a Feather” Valentines Collection. 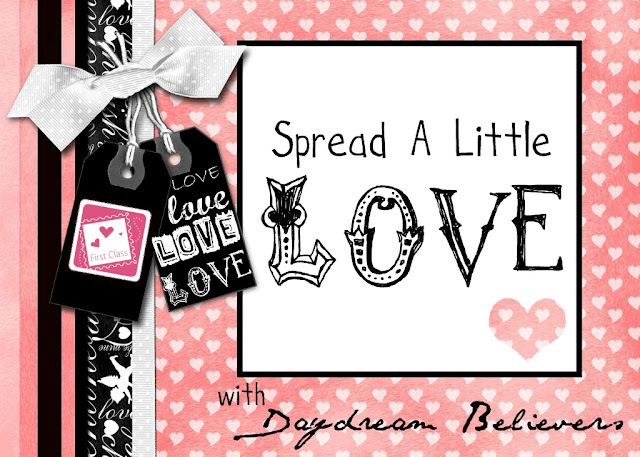 Instead – We’re all going to Spread A Little LOVE! I have 10 pieces, one of each size starting at 6/12 months and going up to 7/8. A few of the pieces are clearly "Valentines" - but the majority can be worn after v-day too! I love 'em all – and I want to GIVE THEM to deserving girls! Yep, I am giving them away. Rather, WE are giving them away! I want ya’ll to help me Spread A Little LOVE this season! Seriously, what is better than putting a smile on someone’s face? How AWESOME will it be to send a sweet little lady a *surprise* package of Daydream Believers loveliness? I am SO EXCITED just thinking about it! Here’s what I want you to do- Send me an email nominating someone to receive one of these packages! Whose day would you like to brighten? Who do you know that would LOVE to receive a special Valentines’ Day outfit? In your email, please include the child’s full name, address, and size. Such a lovely heart you have!! That is awesome! I sent you an email!